Do you consider your home to be safe and secure? How often do you check the locks on your windows and doors? 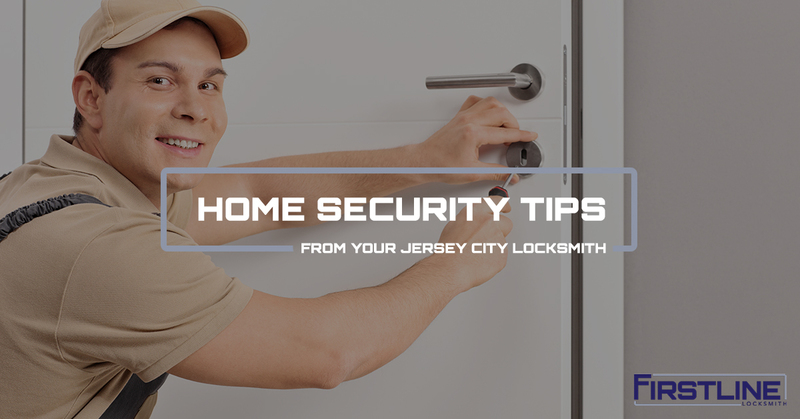 As a premiere locksmith company in New Jersey, Firstline Locksmith has been serving the residents of Jersey City for 25-plus years, and we take pride in knowing how to help our community secure their homes. It’s imperative you have a professional locksmith examine your home’s current locks to determine if they are strong enough to withstand a break-in attempt or if you need to upgrade to a high-security lock system. In this post, we’ll share some important home security tips to help protect your family and make them feel safe. On average, Jersey City sees more than 4,000 property related crimes, including burglary, theft, and motor vehicle theft annually. This means that one in 59 properties will face a crime. Do you want to have the home that the criminal can gain access to relatively easy due to standard window and door locks? Our guess is you don’t. The best way to protect your family is to be proactive and invest in boosting your home security before it’s too late. First, consider installing solid core or metal doors for your front and rear entrances. This will reinforce the door, making it less likely a burglar can bust through it. Second, purchase new deadbolt locks and knob-in-lock sets. Make sure both are high-quality, high-security, and heavy-duty. Third, if you choose to keep your wooden door, install a four-screw strike plate to increase durability against blunt force. Finally, install wide-angle peepholes on all your exterior doors to get a better view of who may be outside. In most cases, a home’s windows are a weak point, and burglars can easily access the inside of a home through the window. First, install additional blocking devices on all accessible windows. Second, add anti-lift devices. Third, stick anti-theft stickers and decals on all accessible windows. Fourth, adjust the window open range to no more than six inches. Finally, install high-security locks and burglar-proof glass on all accessible windows. Once your windows and doors are secured, you may want to consider an advanced security system. These systems can include cameras, motion sensor lights, alarms, and more. The goal is to deter criminals from attempting to target your home. A security system greatly reduces the probability that a criminal will choose your home to break-in and steal from. Remember, you can secure your home. Don’t wait for a crime to occur before considering home security upgrades. Firstline Locksmith has been serving Jersey City and all of New Jersey for more than 25 years. We offer a wide range of professional locksmith services to the families in the city. If you’re concerned about the level security in your home, give us a call today to schedule an appointment!